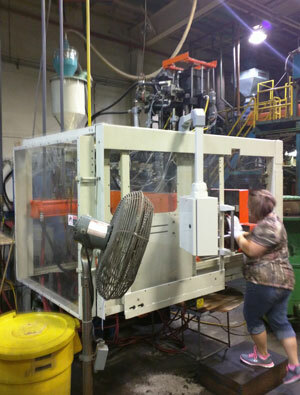 Leading Michigan | Indiana molder and full service plastics parts manufacturer, SPI Industries, has increased its capabilities significantly and upgraded its technology for prototypes and production with the purchase of a new press. The new Impco B30 Press has been installed at SPI Industries’ manufacturing facility in Coloma, Michigan, and will provide an increase to capacity along with an increase in production speed. The installation of the new press with 5 lb accumulator, twin 2.5 lb heads, with manual and auto controller is part of SPI Industries 2014 major expansion project. Since the completion of a constructed 6,000 sq ft warehouse, SPI Blow Molding has stabilized and grown. With increased demand for plastic manufacturing in Michigan and Indiana and throughout the Great Lakes Region, installation of the new press will allow SPI to keep up with increased demand. From product and tool design, to shipment of finished goods, SPI is a full service plastic parts manufacturer poised for continued growth. By increasing its press production capacity, SPI’s customers will benefit from faster turn arounds and increased production quantities. From small runs to high volume injection or blow molding, SPI continues to be a good fit for a large variety of product developers. SPI Blow Molding Engineer, Nick Kraus, said “By investing in the latest technology we are increasing our flexibility and production capabilities, along with automation for larger quantities. The new machine will work alongside SPI’s existing machines on the production line to significantly increase our volume and capacity”. SPI Industries is a leading full service plastic parts manufacturer with blow molding and injection molding capabilities. SPI processes basic polypropylenes and ethylenes to the increasingly popular, and difficult to master, clear polycarbonates. Providing high quality manufacturing services including prototype and pre-production of molds, product assembly, storage, and shipping, makes SPI the complete solution for plastic parts and products. The company designs and assembles molds for a wide range of customers in many industries including appliance, outdoor, recreation, hardware, healthcare, agricultural, furniture, safety and food storage. For more information on how SPI Industries can help you as a top choice, full service plastic parts manufacturer and product fulfillment experts, visit moldedparts.com or call SPI Blow Molding at 269-849-3200 or for Injection Molding call 574-272-3733.